Sure, you could use your house, the side of a barn, or a sheet to project your movie onto. But if you’re going to the trouble of purchasing a high-quality outdoor projector for your movie night fun, why not complement the capabilities of your projector with a specialized, relatively low-cost outdoor projector screen? The screens we chose below are durable, easy to store, and bring out the best colors, resolution, and contrast ratio that your projector can provide. Read our reviews to see if they have the characteristics you’re looking for. This TaoTronics PVC screen is 100 inches large and provides a viewing angle up to 160 degrees, so you’ll have plenty of choices where to sit – further back or off to the side, you’ll still be able to see your movie perfectly. And you won’t be distracted by anything reflecting off the screen, either. The tripod is sturdy and can stand a little wind picking up. It’s heavy enough to keep the large screen supported and balanced. The stand and screen are also very easy to set up. You don’t even need screws to keep the screen frame and stand in place. Cleaning is easy enough with a damp cloth, and you won’t notice any of the yellow stains growing on this screen like you would on some lower-quality models. Because it’s made of PVC, it doesn’t wrinkle or fade. The only drawback is that the screen frame doesn’t collapse, so it might be a little trickier to store. The tripod does come with a carrying case, though, and the entire package only weighs 21 pounds. It also isn’t designed for rear projection, which may or may not be a problem for some users, depending on how you want to set up your presentation. This Elite Screens model has a lot going for it. First, its size is fantastic for outdoor projections at home or at a public event. It also offers a 160-degree viewing angle. You can be sitting almost anywhere off-center of the screen and still see what’s being projected perfectly. Being made of DynBrite means that you can use it outside no matter the weather without any worries of water damage. It also cleans easily with soap and water. The WraithVeil material on the back allows you to set up your movie or presentation for rear projection. The steel frame is sturdy, but you’ll need to use the included stakes and cords to keep it completely stable. While not difficult, staking does add a couple minutes to the setup time. You can roll it up for more compact storage, but you’ll also probably notice some wrinkles developing. You won’t, however, notice any reflection. It comes with a wheeled carrying case and weighs about 30 pounds. This inflatable model uses a quiet fan to blow up it in about two minutes. The actual screen size is approximately 125 inches, and you can use it for front or rear projection. It’s also easy to clean and store. So, what are the downsides? First, because of the large black “frame,” you won’t have as wide of a viewing angle. This isn’t a problem as long as everyone can sit directly in front of the screen instead of off to the side. Second, because it does deflate, you’ll likely notice creases and wrinkles even after it’s fully inflated. It does come with an electric blower, but a carrying case will cost extra. The screen and blower together weigh about 40 pounds, so it’s not the most portable model you’ll find. It also has a very large logo, which might make it unsuitable for professional use. 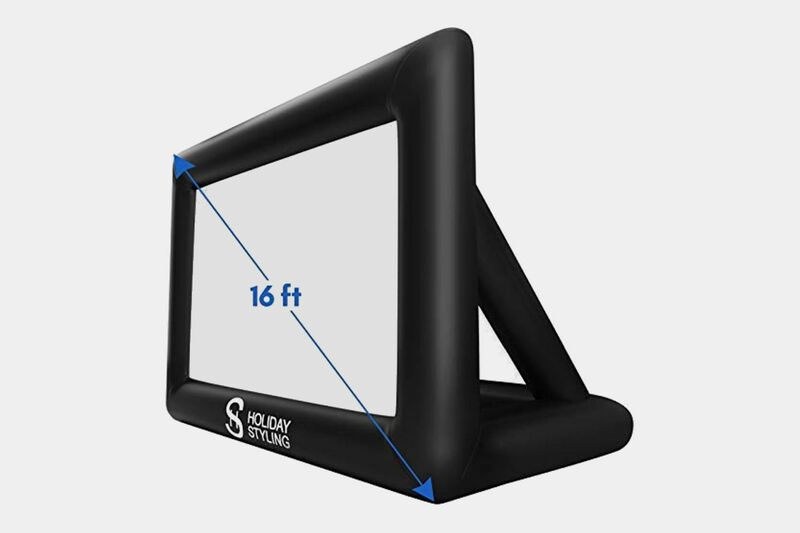 The Holiday Styling inflatable screen is incredibly convenient for family get-togethers, though, even if it doesn’t provide the best of all the features available. This Silver Ticket model is made of ultra-smooth vinyl to display a brighter image. In fact, this is the same material you’ll find in movie theaters. Like some of the others, it provides a 160-degree viewing angle. It folds down for storage, and the frame folds and latches in place when you’re ready to set it back up. It’s easy to clean with soap and water and easy to store and transport too. It comes with a carrying case and weighs less than 30 pounds. Because it does fold down, though, you’ll likely see small wrinkles developing after each use. You purchase this model as large as 220 inches, and you can also purchase additional material to convert it into a rear projection model. With models ranging in size from to 120 inches, you might want to consider one of these JaeilPLM models if you have the possibility of hanging your screen instead of using its stand. The “2-in-1” descriptor means that it comes with a stand that you can also convert into a hanging frame. Put a nail or a hook in the side of your house or barn, and you’ll be ready to go. Otherwise, the triangular stand will keep it sturdy on the ground. Like most projection screens, it has a viewing angle of 160 degrees and almost no reflection. It does roll up and comes with a carrying case for its 13.5-pound weight. Because it’s made of PVC, rolling it doesn’t produce lasting wrinkles, and you can simply wipe it off after each use to keep it clean. This is another inflatable model that’s a little more stylish and little more expensive than the Holiday Styling model we saw before. Like that model, it comes with its own blower and inflates very quickly. It’s a little larger though with a screen size of 123 inches. The viewing angle is also comparable to non-inflatable models because of its slim design. It does wrinkle a little after repeated deflating, but it’s easy to clean and durable. It’s also rather heavy with the entire package weighing about 46 pounds. You’ll also need to stake it to keep it stable outdoors. It comes with a carrying case to keep it all together. Perfect for home use or small group audiences, the 92-inch Camp Chef is easy to store and easy to carry. It’s also made of oxford nylon, making it extremely durable for outdoor use. The steel frame is incredibly sturdy, though you’ll need to stake the screen with cords to keep completely stable in the wind. It’s easy to set up with the collapsible poles, and the whole thing folds up to fit into the included carrying bag. All together, the entire package weighs less than 18 pounds. The only drawback to set up is that you’ll need to clip the screen place, which can take a few minutes to go all the way around the screen. This is not a rear projection screen, but the viewing angle of 160 degrees is comparable to the rest we’re looking at. You can expect some wrinkling of the screen, but it won’t reflect any light. It’s a good budget model available for right around $100. This is another PVC screen model with a collapsible frame and provided stakes and cords for stability. The view range is out to 160 degrees, and with 1.1 Gain, it won’t reflect any light. It comes with a carrying case and, all together, weighs 37 pounds. Because it’s PVC, it’s naturally wrinkle-free, and you can use a damp cloth to wipe it clean. What sets the Visual Apex screen apart is the wall mounts it comes with. The frame itself is not as sturdy as we would like (though it is easy to set up), so if you can hang this off the side of the building, you might be better off. Either way, it’s a good screen with a low price tag (less than $200), and it will serve you well for any outdoor event. Like other PVC models, this is one not capable of displaying with rear projection. With the ability to choose between 120 inches, 140 inches, and 200 inches, this is your opportunity to get the largest screen for a very reasonable price. And besides the impressiveness of the size, it also has the convenience of being inflatable. The blower inflates even the largest size in less than a minute. Afterward, you’ll want to use the included stakes and cords to keep it tight. Also, keep in mind that the screen size will reduce by the width of the black frame. The viewing angle is also limited due to the thickness of the black frame. You can use this model for front or rear projection, and it all fits in an included carrying bag with a total weight of 55 pounds. It’s easy to clean with soap and water, but like other inflatables, you might notice some faint creases and wrinkles once it’s inflated. Despite any drawbacks, this is the best price for the largest size. While you can purchase a Gemmy in a few different models, including one shaped like Mickey Mouse, we like the Deluxe version for its added stability. The shape of the bottom frame is a lot chunkier with a wider spread, so it won’t blow over or need any extra cords and stakes to keep it stable. Stakes and cords are included, however, if you want to use it on a particularly windy night. Beside extra stability, you’ll also get two built-in fans for faster inflation. It’s also a lot lighter than most other inflatable models, weighing only 24 pounds in the bag. The actual screen size is 123 inches, and you’ll get close to a 160-degree viewing angle thanks to the design of the “frame.” Unfortunately, you might also see wrinkles and creases due to the nature of an inflatable. This inflatable is not suitable for rear projection. 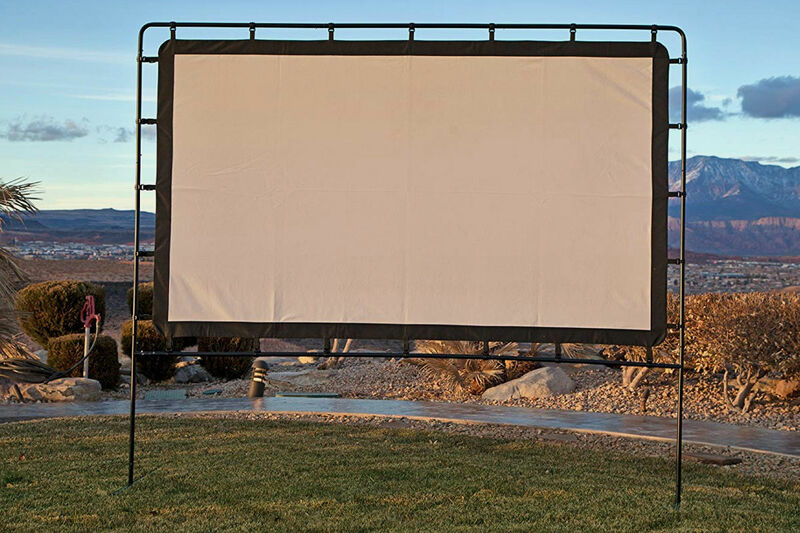 If you’re looking for a permanent fixture for outdoor movie viewing, you can affix a Draper screen to your home, barn, or any other building on your property. Like the old projector screens we had in school, they roll up into the casing where you’re not using them and either pull down or roll down with the push of a button when you want to have an outdoor gathering. These Nocturne models come in a variety of sizes and can be either motorized or manual. Of course, we chose one of the larger models because the larger the screen, the better the viewing experience, right? With a Draper screen, you’ll get 160-degree viewing angle and, of course, easy storage in a controlled roll, so you won’t need to worry about wrinkles or creases. And because it’s a permanent fixture, you won’t need to worry about where to store it when you’re not using it. The only drawback is that the Gain is not as good as the other screens we’ve reviewed. It’s only about 0.8, which means that your movies or presentations won’t appear as bright on this screen. Last up is a big one from Alltec Systems. It’s comparable to many of the fabric and metal screens above. The advantage of this model is its size. With a sturdy frame, wheeled carrying case, and 1.1 Gain, this screen will do an excellent job accommodating a lot of viewers. The only problem is that the viewing angle is limited to 110 degrees. That means that your viewers will need to position themselves directly in front of the screen to see all the action. If 200 inches seems like more than you need, Alltec offers a plethora of sizes. You can also check the different aspect ratios they have available. Most of the screens we’ve reviewed, including this one, are meant for projecting widescreen movies at a ratio of 4:3. Alltec, however, offers different aspect ratios, so if you’re purchasing a projector screen to watch sports beamed from your HDTV (aspect ratio of 16:9), for example, you might want to look into a different size. A high-quality projector screen has anti-reflective properties and a wide viewing angle. You want to look for a screen with a 1.1 Gain, or as close to that as possible to keep reflection down. You don’t a passing car’s headlights or the lights from your house to reflect off the screen when everyone’s trying to watch a movie or a night-time presentation. If you want to have a large gathering, you’ll also want to look for projector screens that offer a 160-degree viewing angle. With such a range, people can spread out and sit at an angle in front of the screen without having any distortion. You’ll also want to think about how easy the screens are to set up, how stable they’ll be if a breeze picks up, and how easy they are to store. Keep in mind that when you fold, roll, or de-inflate a screen, you could cause permanent wrinkles in the material. Most people don’t mind the slight wrinkles once the movie starts, but if you think that will bother you, consider PVC screens or plan to keep your screen set up in the garage or somewhere else you can keep it flat but out of the way. Outdoor projector screens generally come in two types: separate screens with metal frames or inflatables. Depending on the material, a separate frame will give you the best, wrinkle-free picture. The easiest to set up and store, however, is the inflatable models. Because of the thickness of the material, though, inflatable models also tend to be the heaviest. Not all projector screens can accommodate rear projection, so think about how you want to set up your projector. If you plan on using your screen for delivering presentations at various locations, you’ll probably want to buy a screen that can function with both front and rear options so that you have as much versatility as possible.